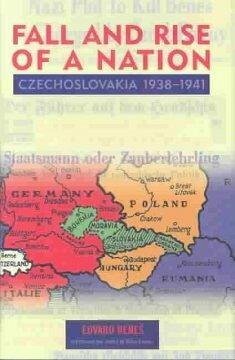 From Czechoslovakia's former president comes a unique account of the last two weeks of September 1938, chronicling the country's approach to the Munich pact. Based on newly discovered and previously unpublished manuscripts and augmented with wartime speeches and other important documents, this book recounts the painful experience of the Sudeten Crisis, the Munich Diktatof September 1938, Hitler's invasion of Prague six months later, and the formation of Edvard Benes's government-in-exile. Surprisingly, Benes's account is not from a pro-Soviet perspective -- as he might have been expected to write in 1945 -- but from the perspective of mid-1941, when he made the sound forecast that "Germany is not able to win this war; the winner will in the end be the side that retains the command of the seas." At this stage, despite the collapse of France, the heavy losses suffered by the British, Germany's alarming successes against Russia after the recent invasion, and the continued nonbelligerency of the United States, Benes remained optimistic about the final victory of the Anglo-Americans. "Everything I predicted has happened," Benes often said. That did not go well with the British Foreign Office, which turned down Benes's text for containing too much criticism of the earlier, disastrous British policy of appeasement. Certainly one of the most controversial European statesmen, Benes represented a small country but had an unusually large impact on this crucial historical junction. Fall and Rise of a Nation gives readers insight into how this happened, presented in the words of the man himself. Milan Hauner provides a detailed introduction and critical annotations to this unique resource on World War II history, covering the disappearance and restoration of Czechoslovakia.